When my youngest daughter was in the very beginning pre-reading stages, it seemed like she rhymed every single word she could think of. She would rhyme words in her sweet little sing-songy voice during bath time, while playing mud pies, while she worked on a craft, and even during dinner. She got the hang of rhyming words quickly and she still enjoys rhyming, even though she’s almost 7! Rhyming words is a very important pre-reading skill for young learners. There are many activities to help children recognize rhyming words, and today I’m sharing a fun hands-on way to practice! 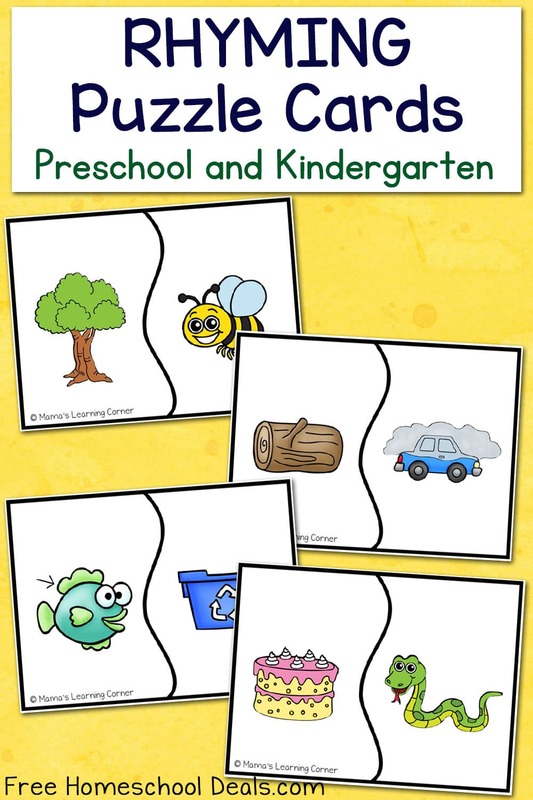 These rhyming puzzle cards are a fun, hands-on way to practice rhyming words with your Preschooler or Kindergartner. To play, simply cut the cards apart on the dark black lines. Your child then joins the correct puzzle pieces together, connecting the two pictures that have the same sound. This set contains 12 rhyming puzzle sets. If your child is younger, simply set out 4 to 5 sets at the time as to not overwhelm him.